Post breakfast, get ready for an excursion to Mt Titlis. Take pleasure of a joyful ride on the first ever revolving ‘RO TAIR’ gondola of the world. This ride offers Alps’ 360° panoramic view. Visit the Ice Grotto on the mountain. Here enjoy the new ‘Ice Flyer’, which is a chair lift ride over the glaciers. The views of ice falls, crevasses, etc., are mesmerizing. Do not miss to enjoy a snow slide on the ‘Fun lift’. Later, return to your hotel in Lucerne for an overnight stay. Following breakfast, get ready for an excursion to Mt Jungfraujoch. Being the apex of Europe, at 3454 meters, this is the highest altitude railway station of Europe. Moreover, this is the major highlight of every Switzerland trip. This place offers a high-Alpine wonderworld of snow, ice, and rock. Take pleasure in viewing from the Sphinx Observation Terrace confronting the Aletsch Glacier, and spectacular Ice Palace. Later return to your hotel in Interlaken for an overnight stay. Post breakfast, leave to board a train to Zurich from Interlaken. On your arrival at Zurich, get transferred to your hotel, check-in, freshen up and take a little rest. Thereafter, enjoy Zurich Trolley Tour. 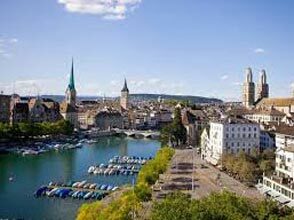 Explore the beautiful Zurich city and see Bahnhofstrasse - the financial & business center. The important museums are also major attractions of the Old Town. 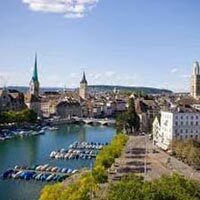 Return to your hotel in Zurich for an overnight stay. In the morning, after breakfast checkout and reach Zurich Airport on your own, to board a flight for your onward journey.